Michelle Loureiro has a Masters in Physical Therapy with over 13 years experience in Outpatient Orthopedics & Sports Physical Therapy. Michelle brings a wealth of expertise to her role on Breakaway Training’s Performance Support Team. She specializes in orthopedics and sports medicine utilizing manual techniques, neuromuscular re-education, and therapeutic exercise to enhance proper functional movement. She performs biomechanic and postural evaluations providing recommendations for optimal body mechanics. She has a special passion for running and gait mechanics and provides visual and video gait analysis for runners to improve their performance while preventing injuries. 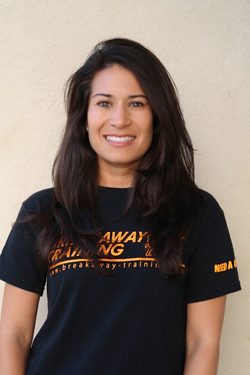 Michelle is active in triathlon and has been a Breakaway Training Team member since 2008.